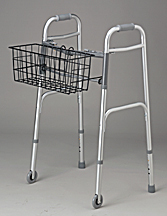 Wire basket attaches to almost any walker. Measures 5 1/2" x 16" x 7". Holds up to 3 lbs.